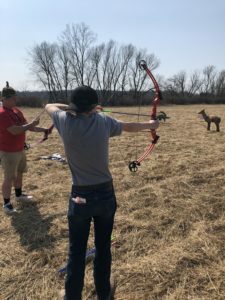 On one of the first warm days of the spring season, the OTG Jr. program was hard at work in the Sharonville State Game Area (SGA). 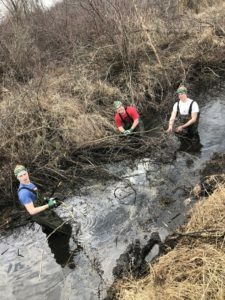 The first OTG Jr. project of the season found a group of 10 high school students working to clear brush and fallen woody debris from a drain to improve water flow through one of the units in the SGA. The brush was also used to create small piles for rabbit habitat. The 10 students were part of Mrs. Amy Gillhouse’s Vocational Tech class through the Lenawee Intermediate School District. These 10 students represented six different school districts from around Lenawee County. Joining them were three chaperones, Huron Pines AmeriCorps Member Autumn Christenson and myself. After a 1-hour bus ride, the students piled off the bus and were full of energy. These high school juniors and seniors were so full of energy they decided to walk a mile back into the site rather than drive. 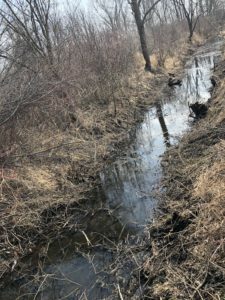 Once we arrived at the drainage ditch, there was no holding them back. At the instant, I mentioned we had some waders; these kids were fighting over who would get to wear the waders and get into the water. The work began and we had three groups of kids working along the ditch line. One group of kids was working on clearing a path and trimming downed trees. The second group was in the water pulling out fallen debris and handing it to the third group on the bank. The group on the bank then piled the logs and debris into brush piles. The students worked enthusiastically and efficiently. There was a lot of friendly banter about who could lift the biggest logs and what seemed to be a competition to see who could get the most mud on their faces. We also learned that all four pairs of our waders have holes in them, so the students had mud in their sock and on their pants as well. Around Noon, we took a break for lunch and the students devoured five large pizzas in about 20 minutes. During lunch, Autumn and I talked a little about MUCC, AmeriCorps and how we reached the stage in our career we were in. Project planner and DNR Wildlife Biologist Denny Tilson also joined us. He talked about the importance of the work the students were doing for the habitat, the path it takes to become a wildlife biologist and where funding for game areas come from. In the afternoon, the students honed their archery skills and more friendly banter on shooting ability occurred. 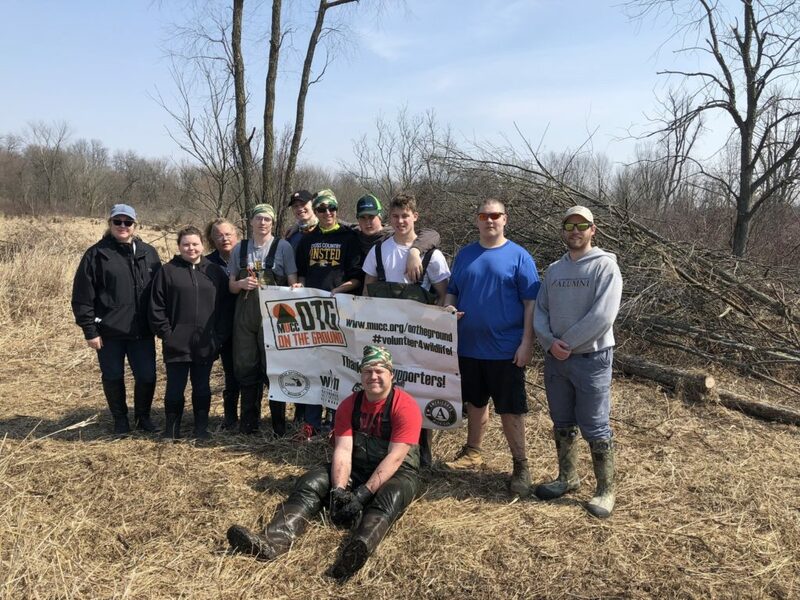 The day wrapped up around 3:00 PM with a group of tired high school boys and improved streamflow through the managed area. I would like to thank Denny for planning the project Mrs. Gillhouse for helping organize the day and the students for doing the work.